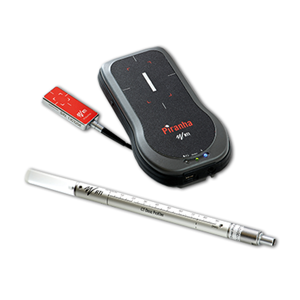 With the Piranha Premium Kit, you get the Piranha along with a number of its probes and accessories well-organized and safely stored in a robust Aluminum Case to a very competitive price. The Premium Kit is based on a Piranha 657 for Radiography, Fluoroscopy, CT, Dental and Mammography. The RTI Dose Probe is an external dose probe, designed to perform very low dose rate measurements for instance on image intensifiers. To avoid or minimize interference with AEC (Automatic Exposure Control) on X-ray equipment, the probe is very small. This also enables to fit it into the table bucky. Since it is a solid-state detector, no corrections for pressure or temperature are needed. Neither is bias voltage. With the extra ordinary sensitivity of the external Dose Probe it is even suitable for scatter and leakage measurements.